Ice cream is perhaps one of the most popular foods in the world. While many people visit their local ice cream parlor or grocery store frozen food aisle to satisfy their ice cream fix, this delicious and often decadent dessert can be made right at home. Those who want to try their hands at homemade ice cream should consider the following recipe for “Caramelized Honey Ice Cream With Rosemary and Orange” from Lori Longbotham’s “Luscious Creamy Desserts” (Chronicle Books). Bring the honey to a boil in a medium heavy saucepan over medium heat. Boil for 5 minutes, or until darkened, but not burned, and very fragrant. Remove the pan from the heat. Bring the cream and milk just to a boil in a large, heavy saucepan over medium heat. Stir in the rosemary and zest, remove the pan from the heat, and let stand, covered, for 15 minutes. Discard the rosemary and zest. Whisk the honey into the cream mixture and cook, whisking occasionally, over low heat for a few minutes, until well combined and smooth. Whisk together the egg yolks, sugar and salt in a medium bowl. Slowly pour in the warm cream mixture, whisking constantly. Return to the saucepan and cook, whisking constantly, over medium-low heat until the custard has thickened and coats the back of a spoon; if you draw your finger across it, it should leave a track. Do not let the custard boil or scorch on the bottom; if tiny bubbles appear around the edges, remove the pan from the heat for a few minutes to cool the custard, continuing to whisk. Pour the custard through a fine strainer set over a large glass measure or bowl. Whisk in the orange juice. Let cool to room temperature, whisking occasionally, then refrigerate, tightly covered, for 3 hours, or until thoroughly chilled, or for up to 1 day. When ready to freeze, pour the mixture into an ice-cream maker and freeze according to the manufacturer’s instructions. Transfer to a freezer container and freeze for at least 2 hours before serving. 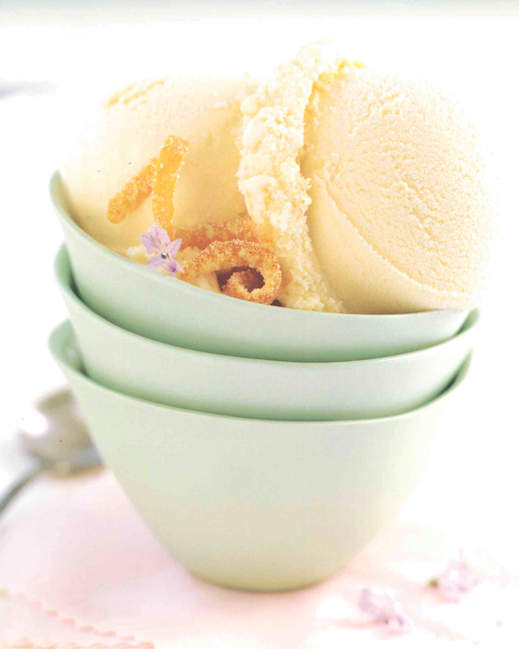 To serve, spoon the ice cream into serving bowls or glasses. Drizzle with the Honey Caramel Sauce, if desired. Bring the honey to a boil in a medium, heavy saucepan over medium-high heat. Boil for 5 minutes, or until darkened, but not burned, and very fragrant. Reduce the heat to medium-low and slowly and carefully pour in the cream. Add the salt, bring to a boil over medium heat, and boil for 5 minutes, or until slightly thickened; the sauce will thicken further as it stands.